“Multiple Sclerosis and the Caregivers” is an award-winning documentary that is used to teach the caregivers of people with Multiple Sclerosis that they need to care for themselves as well if they are going to give the best possible care. It features real people who have successfully struggled with this complex issue. Cogent created this live event for UCSF at the San Francisco Yerba Buena Center for the Arts in San Francisco, CA. Its purpose was to have national public forum via satellite at 17 centers across the country to discuss current trends is medical research and its impact on public health. This documentary (currently in production) features the Nanking CJ-6 pilot trainer and the people who have a passion for flying them in formation, simulated dogfighting, and airshows. This video animation demonstrates the ArthroCare TOPAZ microdebrider for minimally invasive surgery on tendons by the application of radiofrequency energy for precise removal of soft tissue with minimal destruction to tissue. This video was a bilingual class project taught by Michael Yonchenko for the 9th graders at Instituto de Las Americas Bilingue Plantal Vallarta in Puerto Vallarta, Jalisco, Mexico. These students wrote, directed, shot the video that was intended to invite parents to enroll their children in the school. Glen Ellen Star is a widely respected restaurant in Glen Ellen, CA (Sonoma Valley). This video is intended to introduce prospective customers to the restaurant, its chef and owner Ari Weiswasser, and his unique and inviting approach to cooking for and feeding his customers. One of our goals was to demonstrate that small businesses can afford to produce award-winning quality videos at a very reasonable price. Johnson & Johnson created this unique program for newly-diagnosed sufferers of schizophrenia and bipolar disorder called “Recovery4Today”. In 9 different sessions these patients learn about the disease, how it works in the human brain, how it is treated, and how to live productive and meaningful lives using effective health management techniques. Each session begins with a video segment that is presented by a clinician that is intended to trigger a topical discussion among meeting attendees. 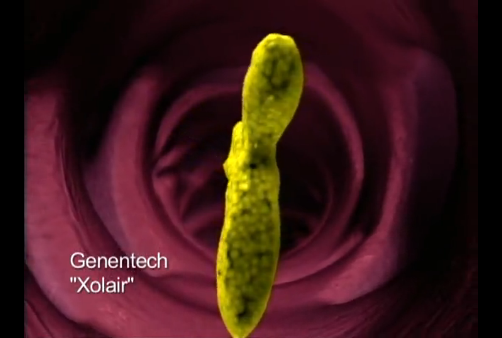 “Genentech Xolair” was produced for Genentech and Novartis as a new product introduction video. Xolair is a breakthrough drug used for the treatment of asthma. Included in this segment is a 3D animated demonstration of how the drug works on a cellular level in the lungs. Also included were video segments with physicians and patients. This animation was produced in collaboration with award-winning animator Mark Wrabel of Lumen3D in San Francisco, CA.